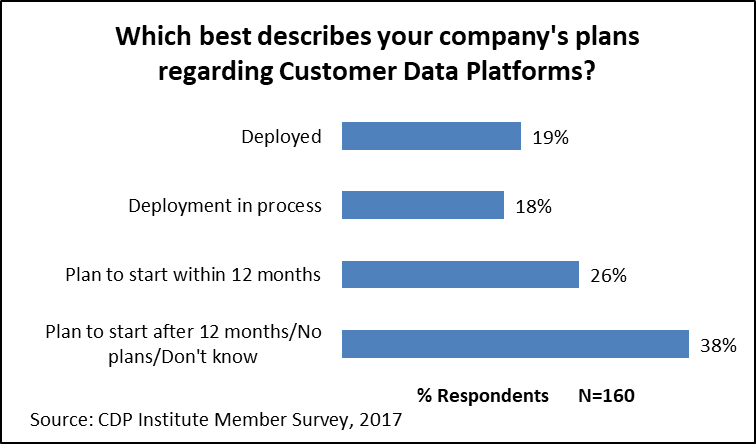 The Customer Data Platform Institute (CDPI) recently surveyed its members about their customer-facing systems and CDP deployment plans. (Click here to download the full report.) While CDP Institute members are obviously not typical marketers (being smarter, richer, and better looking), the answers still provide some intriguing insights into the marketplace. Let’s start with the general state of customer facing systems. One-third reported they had many disconnected systems, just over one-third reported (37%) they had many systems connected to a central platform of some sort (9% unified customer database, 9% unified database and orchestration system, or 19% marketing automation or CRM platform), 6% said one system does almost everything, and the remaining 23% said they had some other configuration or didn’t know. I’ve compared these results below with several other surveys that asked similar questions. The one thing that immediately jumps out in this comparison is the CDPI Member survey showed a much lower percentage of replies for “one primary system”. Otherwise, the answers across all surveys are very roughly similar, showing about 30% to 50% of companies having many connected systems and many disconnected systems. This suggests more integration than I’d expect, but it depends on how much integration those “many connected” systems really represent. The CDPI Member survey also asked about plans regarding Customer Data Platforms. Nineteen percent had a CDP already deployed, 18% had deployment in progress, and 26% planned to start deployment within the next 12 months. The remaining 38% either planned to start after 12 months (4%), had no plans to deploy (19%) or didn’t know (14%). I haven’t seen any other survey that asks this question but have no doubt that CDP deployment and plans are much higher for CDPI members than the rest of the industry average. Where things get really interesting is when we explore how the same people answered these two questions. At first blush, you’d assume the 19% with a deployed CDP would be the same 18% who said they had many systems connected to a unified customer platform, either by itself or with an orchestration engine attached. Not so much. Here’s the actual cross tab of the results. What you see (in the yellow cells) is just 42% of the people who said they had a deployed CDP also said they had many systems connected to a unified database. 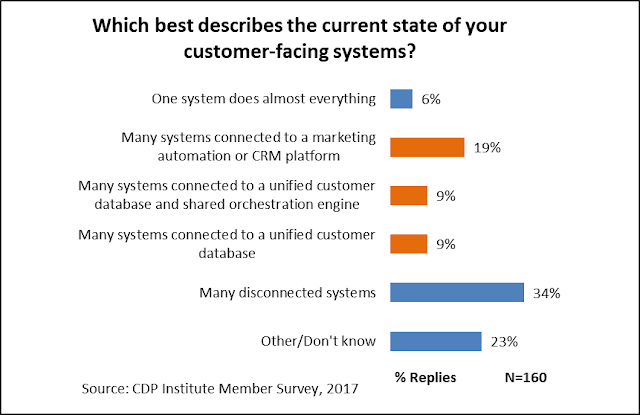 If we allow that a deployed CDP could be present in companies where one customer-facing system does almost everything or the customer facing systems are connected to marketing automation or CRM, then 74% of the deployed CDPs are covered. I take the remaining 26% as a healthy reminder that just having a CDP doesn’t guarantee all your systems will connect to that CDP, either by feeding data into it or reading data from it. In fact, we know that many CDPs support analytics without being connected to delivery systems, so this really shouldn’t come as a surprise. On a more encouraging note, as the green cells highlight, a good majority of in-process and planned CDP deployments are at companies with many disconnected systems or many systems connected to a marketing automation or CRM. Those are the companies most in need of data unification. So it does appear that the CDP message is reaching its target audience and CDPs are being used as intended. The survey also asked about company revenue, business type (B2B vs B2C), and region. Comparing those with current systems and CDP deployment also gave some interesting and unexpected results. But there's no point in repeating them here since you can download the full report and see for yourself. Enjoy! My wife is working on a Ph.D. in education and recently took a course on strategic planning for academic institutions. Her final project included creating a game to help illustrate the course lessons. What she came up with struck me as applicable to planning in all industries, so I thought I’d share it here. The fundamental challenge she faced in designing the game was to communicate key concepts about strategic planning. The main message was that strategic planning is about choosing among different strategies to find the one that best matches available resources. That’s pretty abstract, so she made it concrete by presenting game players with a collection of alternative strategies, each on a card of its own. She then created a second set of cards that listed actions available to the players. Each action card showed which strategies the action supported and what resources it required. There were four resources: money, faculty, students, and administrative staff. To keep things simple, she assumed that total resources were fixed, that each strategy contributed equally to the ultimate goal, and that each action contributed equally to whichever strategies it supported. - Four strategies. In my wife’s game, the options were to build up the department, cooperate with other departments at the university, cooperate with other universities, or promote the department to the media and general public. - A dozen actions. Each action supported at least one strategy (scored with 1 or 0) and consumed some quantity of the four resources (scored from 0 to 3 for each resource). Actions were things like “run a conference”, “set up a cross-disciplinary course” and “finance faculty research”. - Four resources, each assigned an available quantity (i.e., budget). The fundamental game mechanism was to pick a set of actions. These were scored by counting how how many supported each strategy and how many resources they consumed. The resource totals couldn't exceed the available quantities for each resource. The table below shows scoring for a set of three actions. In this particular example, all three actions support "cooperate with other departments", while two support "build department" and one each supports "cooperate with other universities" and "promote to public". Resource needs were money=8, faculty=6, student=5 and administration= 1. Someone with these cards could choose "cooperate with other departments" as the best strategy -- if the resources permitted. But if they were limited to 7 points for each resource, they might switch the "fund scholarship" card for the "extracurricular enrichment" card, which uses less money even though it consumes more of the other resources. That works because, with a budget of 7 for each resource, the player can afford to increase spending in the other categories. As this example suggests, the goal of the game is to get players to think about the relations among strategies, actions and resources, and in particular how to choose actions that fit with strategies and resources. - Predefine available resources and let different players draw different action cards. They would then decide which strategy best fit the available cards and resources. - Give different strategy cards to different players and put all action cards face up on the table. Players then each choose one action card in turn, trying to assemble the best set of actions for their assigned strategy. - Randomly select the resource levels at the start of the game and let all players use all action cards. The winner is whoever first finds combination of actions that yields the most points for any strategy without exceeding the resources available. Other rules are possible, along with refinements such as making some strategies more valuable than others at reaching the goal and making some actions more effective than others at supporting a given strategy. But my wife had ten minutes to explain, play, score and discuss the game, so the simplifications made sense for her situation. - different strategies can reach the same goal. Identifying available strategies and choosing among them is an important part of strategic planning that's often not clearly recognized. - different actions can support different strategies. This has two implications: strategies are initially chosen in part based on what actions are available and, later, actions are evaluated based on how well they support the chosen strategy. - different actions can compete for the same resources. In the short run, the combination of actions must be chosen to maximize the value achieved from the resources available. In the long run, resources are not fixed, so organizations can decide which resources they need to support the actions they need for strategic success. - different strategies are best suited to different combinations of resources. This is the ultimate message of the game. Actions are just intermediaries to help understand how specific strategies and specific resources are related. I hope you find this interesting and perhaps even useful. It’s more thought experiment than actual game. But if you’re inspired to create your own physical version, do send me pictures. - Pushback against the walled garden vendors (Facebook, Google, Amazon, Apple, etc.) Those firms continue to dominate life online, and advertising and ecommerce in particular. (Did you know that Amazon accounted for more than half of all Black Friday sales last week?) But the usual whining about their power from competitors and ad buyers has recently been joined by increasing concerns among the public, media, and government. What’s most surprising is it took so long for the government to recognize the power those companies have accrued and the very real threat they pose to governmental authority. (See Martin Gurri’s The Revolt of the Public for by far the best explanation I’ve seen of how the Internet affects politics.) On the other hand, the concentrated power of the Web giants means they could easily converted into agents of control if the government took over. Don’t think this hasn’t occurred to certain (perhaps most) people in Washington. Perhaps that’s why they’re not interested in breaking them up. Consistent with this thought: the FCC plan to end Net Neutrality will give much more power to cable companies, which as highly regulated utilities have a long history of working closely with government authorities. It’s pitifully easy to imagine the cable companies as enthusiastic censors of unapproved messages. - Growth in alternative personal data sources. Daily press announcements include a constant stream of news from companies that have found some new way to accumulate data about where people are going, who they meet, what they’re buying, what they plan to buy, what content they’re consuming, and pretty much everything else. Location data is especially common, derived from mobile apps that most people surely don’t realize are tracking them. But I’ve seen other creative approaches such as scanning purchase receipts (in return for a small financial reward, of course) and even using satellite photos to track store foot traffic. In-store technology such as beacons and wifi track behaviors even more precisely, and I’ve seen some fascinating (and frightening) claims about visual technologies that capture peoples’ emotions as well as identities. Combine those technologies with ubiquitous high resolution cameras, both mounted on walls and built into mobile devices, and the potential to know exactly who does and thinks what is all too real. Cross-device matching and cross-channel identity matching (a.k.a. “onboarding”) are part of this too. - Growth in voice interfaces. Voice interfaces don't have the grand social implications of the preceding items but it’s still worth noting that voice-activated devices (Amazon Alexa and friends) and interfaces (Siri, Cortana, etc.) have grown more quickly than I anticipated. The change does add new challenges for marketers who were already having a hard time figuring out where to put ads on a mobile phone screen. With voice, they have no screen at all. Having your phone read ads to you, or perhaps worse sing a catchy jingle, will be pretty annoying. To take a more positive view: voice interfaces will force innovation in how marketers sell and put a premium on agent-based services that make more decisions for consumers. Of course, that's only positive if the agents actually work in consumers’ interest. If the agents also serve other masters – such as companies that pay them to send business their way – consumers can easily be harmed. But at least they’ll have more time for things other than shopping. - Retailers focus on convenience. Speaking of shopping: retailers with physical stores continue to panic about the growth of Amazon and other ecommerce vendors. What I find surprising isn’t the panic, but that their main reaction has been to introduce innovations like “BOPIS” (buy online, pick up in store) that focus on shopper convenience. Nothing will ever be more convenient than ordering remotely and having stuff delivered, so this is a game they’re guaranteed to lose. It’s clear to me that the future of in-store retail depends on creating entertaining, enjoyable experiences, and specifically on human interactions that online merchants can’t duplicate. Those interactions could be with store personnel, friends, and other shoppers. I’ll violate my rule against predictions and say here that categories of in-store retail that aren’t inherently entertaining will vanish (think: grocery shopping except maybe for fresh produce). But I'll hedge my bet by not saying when. 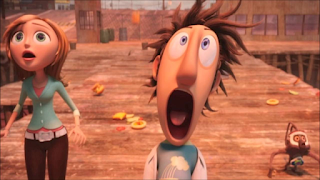 - Marketing clouds increase their share. I don’t recall seeing any actual data on this, but my distinct impression from talking with buyers is that the major marketing clouds (Adobe, Salesforce, Oracle) are being bought by more companies. This shouldn’t have surprised me: I’ve spoken for years about “Raab’s Law”, which says that integrated suites always beat best-of-breed components in the long run. It seemed briefly that marketing technology would be different, largely because cloud-based systems make integration so much easier than before. The vast profusion of specialized martech systems seemed to support this view. But it’s clear we’re now seeing “martech fatigue” set in, as marketers tire of purchasing an endless array of new systems they then barely use. One bolt of lightning to illuminate this was a recent Gartner survey that found martech spend is now falling. This bodes ill for independent martech vendors and suggests that the long-awaited consolidation may finally be at hand. The question really is how long the momentum of wilder times will carry many of today’s martech point solutions before they fall. - Interest in self-service technology. I’ve seen several recent announcements related to the idea that marketers and non-technical users in other departments will develop their own systems using varying types of advanced technology. Chatbots, predictive models, and entire business process integrations have all been offered as things business users could create for themselves, often with a little help from artificially intelligent friends. Bosh, I say. Marketers are already overwhelmed by the complexity of their tools and in particular by the challenges of connecting separate systems. The cloud and AI might make this easier but they don’t make it easy. The growth in marketing clouds shows marketers voting with their budgets to avoid integration. To be clear, what surprises me is that people think self-service will work or even that it’s desirable. They should know better. - No Customer Data Platform acquisitions. Okay, maybe I’m the only person who thinks about this. But it’s still pretty odd that none of the big marketing clouds has yet purchased a CDP vendor. (The only deal I recall was Campaign Monitor buying Tagga and those are not major players.) I can think of many ways to explain this: cloud vendors don’t see the problem, they think they’re already solved it, they don’t want to admit they haven’t solved it, they don’t want to reengineer existing products to use a CDP, they prefer to buy companies with large market share, they think they can build their own CDPs, etc. But, ultimately, the big marketing clouds haven’t purchased a CDP because their clients haven’t pushed them for one. The marketing clouds will act quickly once they start losing deals because clients want CDP functions the vendors can’t provide. Maybe the limited degree of integration within the existing marketing cloud architectures is enough, or maybe buyers don't realize it's inadequate until after they’ve made the purchase. I fully expect acquisitions to happen – oops, another prediction – but not very soon. And if the clouds continue to increase their share without adding a CDP, maybe it won’t happen at all. So much for surprises. Lest you get the impression that I’m always wrong, I'll list some things that haven’t surprised me one bit. - No pressure on privacy. While many people keep expecting consumers to really start caring about personal privacy, I’ve never seen any reason to think that will happen. Experience has shown that even the smallest reward is enough for people to expose pretty much everything there is to know about themselves. Sometimes it doesn’t even require paying money; just a bit more convenience or recognition is enough. If anything, people are getting more used to everything being public and thus less concerned about keeping anything private. They suspect, probably correctly, that it’s a losing battle. - Lack of unified customer data. Marketers have talked for years about the need for a complete customer view and the integrated, omni-channel customer experience that’s needed to support it. It’s possible there’s actually been some progress: while surveys used to show 10-15% of marketers said they had a unified view, I’m now often seeing figures in the 25-40% range. I don’t believe the real numbers are anywhere that high but maybe they indicate a little improvement. Even so, given the important assigned to the topic, you might expect the problem would mostly be solved by now. I’m not surprised it hasn’t been: building a unified view is tough, more because of organizational obstacles than a lack of technology. So things will continue to move slowly. - AI bubble remains unburst. Surely it’s time for people to stop getting excited every time they hear the term “artificial intelligence”? Apparently not; pretty much every new product I see announced, including vacuum cleaners and doorknobs, has an AI component. People will eventually expect AI to be built into everything, just as they expect electricity, plastics, and other previous miracle technologies. But it takes a long time for people to recognize what’s possible, so I’m not surprised they still find even basic AI features to be amazing.